Who doesn’t love processed food? It’s easily accessible and practically everywhere – from bus interchanges, to shopping malls, and even in schools. We understand the craving for it because old habits die hard and once kids get a taste for it they’ll want it even more. However, here are some tips you could use to make sure your child is eating right and adopting mindful eating mindset from young. When doing grocery shopping, it’s good to remember that your choice of food, milk, and snacks will make a difference in the nutrients that your little ones will receive. To elaborate on this, it is a good idea to consider organic ingredients for your grocery items. For example, when looking for pastas to cook for your family, you can opt for Bellamy’s Organic Brown Rice Pasta instead of the conventional ones because along with a good source of iron, it is gluten free. The best part is that there is no added sugar or salt. When your little ones are exposed to a healthy diet from an early stage, you will notice that they are likely to continue with this regime even when they get older. If you store junk food in your home, you’re sending mixed messages to your little ones. They may feel that it’s perfectly fine to consume these unhealthy type of snacks. In order to set a proper regime, you should eliminate packaged and processed snack foods from your kitchen. As part of grocery shopping, do not purchase junk foods such as conventional candy and biscuits, which contain high sugar and sodium count. We understand that for some working mummies, it can be tough to prepare a healthy snack or fight the urge to buy them at the supermarket, especially when you’re juggling between the family and work. 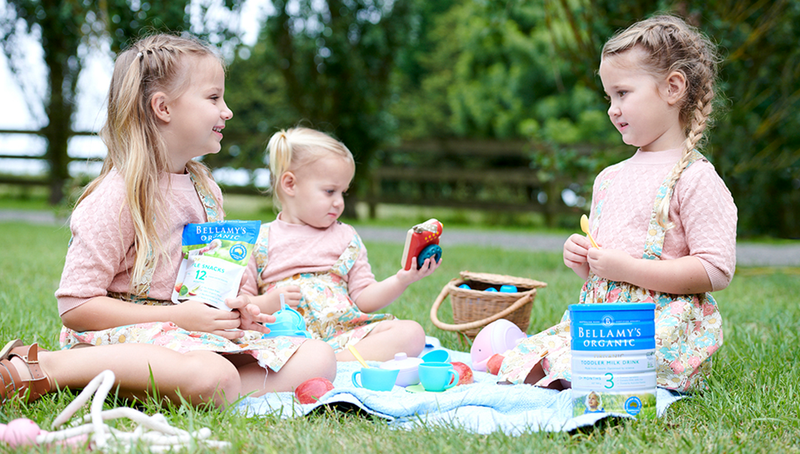 Bellamy’s Organic snack is bound to delight your little ones, and you can even share it with them! It’s made of 100% fruit with no sugar added! It’s convenient packaging makes it easy to bring it almost everywhere with you. To make it easier for your little ones to intake healthy snacks, you can make fresh fruits look visually good by cutting them into fun shapes like hearts or stars. If you want to make it extra special for them, include them in the preparation so you ignite their interest and they will be more inclined to ask for it again the next time. By cooking at home, not only is it more economical, you also get to control the sodium and nutrient level that your loved ones get to consume. The kind of food that you will find on children’s menu in restaurants often add sugar, salt and fat just to enhance the taste of the foods on their menu. What is important to note is that these additives aren’t necessary for making foods taste good. If you would like to have some homemade food ideas, you can find the recipes here. Take your little ones to the playground! Be it outdoor or indoor, it is a great way to get the family active and have a good time. Apart from playgrounds, in this hot weather, it’s worth considering bringing your little ones for a swim. Not only do they get to be active, it’s fun and parents get to snap cute family photos and save it for memories. What better way to have quality time as a family? It’s never too late to start a healthy regime for your little ones, and we hope that these tips will help you kickstart the journey to better well-being. If you are wondering where to get organic food for your toddler, take a look at our full range of products at Bellamy’s Organic and visit our stockists — we offer infant milk, ready-to-serve baby food, snacks and more. Contact us today to find out more.